The world food supply is entirely dependent on the use of fertilisers. However, the current fertiliser production practices are not sustainable. Phosphate rock is a non-renewable resource, whereas the nitrogen-based fertilisers production is highly energy-intensive, currently relying on the use of fossil fuels. Domestic wastewater is an important nutrient carrier, but currently not exploited as recovery from diluted sewage is not efficient. Run4Life proposes a radical new technological concept for wastewater treatment and nutrient recovery. It is based on source-separated collection of domestic wastewaters and kitchen waste, with each flow receiving optimal treatment for resource recovery and subsequent safe reuse. Innovative nutrient recovery technologies are integrated with complementary fertiliser concepts to reduce environmental and health risks. The entire nutrient recovery value chain will be demonstrated to the end user. Nutrient recycling from wastewater opens a new paradigm in society. Therefore active measures such as knowledge brokerage activities will be developed as engagement strategy to advocate the institutional, legal and social acceptance of Run4Life nutrient recovery technologies. Communication and dissemination activities will be focused on different stakeholder levels aiming at the maximisation of market success. The innovative technological solutions will be demonstrated at four large scale demosites, two of which are to be built during the course of the project. The scheme below gives an overview of the Run4Life technological concept. Different symbols show which techologies are part of which demosite. The Run4Life project has 8 interlinked work packages. The WPs are closely collaborating, as shown in the diagram. For an overview of the project partners see the partner section. Below, brief descriptions of the objectives of each of the WPs are given. More elaborate work descriptions are being elaborated and will be published in the near future. Aqualia This WP aims to secure the allocation and coordination of all resources (human and financial) in order to reach the project objectives within the pre-defined contractual and time frames. It describes the processes and responsibilities to be implemented for the good execution of the project, including: i) Coordination and management of the project, ensuring an efficient and timely execution of all planned activities; ii) To guarantee an accurate and on time communication flow among partners and with the EC in order to track the project progress and meet its objectives and iii) To complete the project within the agreed time schedule and budget. Wageningen University and Research The overall objective of WP2 is to upgrade the proposed innovative technologies for efficient nutrient recovery so that they can be further integrated in the Large Demonstration Sites already running in WP3 with the aim of improving recovery rates and material qualities of recycled nutrients. Therefore, each one of the technical tasks will be aimed at developing and operating the technology, evaluating the obtained results in order to define key parameters to optimise integrated performance. This overall aim includes: i) Development of improved ultra low flush toilets based on vacuum technology for decreasing water consumption in toilets up to <0.4 L (2 L/person·d) and obtaining high concentrated BW; ii) Optimising Hyper-Termophilic Anaerobic Digestion (HTAD) technology for achieving hygienically safe fertilisers in a one step process; iii) Development of Bioelectrochemical Systems (BES) for efficient N recovery iv) fluidised bed optimization and demonstration and v) Accomplishment of a technology roadmap aimed at generating further innovation developments. 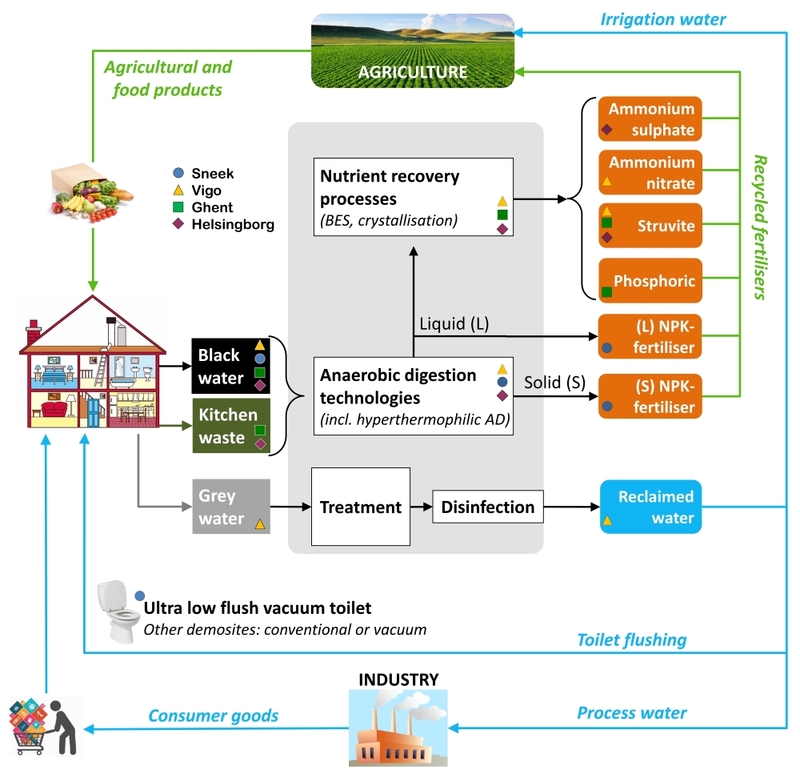 DeSaH The main objective of this WP is to demonstrate and validate at large scale an optimised resource recovery system integrating multiple innovations (WP2) adapted to 4 different scenarios in order to tap the potential of nutrient recovery throughout Europe. The maximisation of the nutrient recovery for fertiliser and reclaimed water production will be achieved by accomplishing the following partial objectives: i) Obtaining upgraded P-based fertilisers (struvite and phosphoric acid) from non-separated BW+KW, while adopting an innovative Business Model based on cooperative financing scheme (WP7) (Ghent); ii) GW reuse for toilet flushing in parallel with BW treatment by means of AnMBR, recovering: solid NPK fertiliser, disinfected NPK liquid fertiliser, struvite, ammonium nitrate solution by BES innovative technology and reclaimed water, which will be treated by UV-LED and H2O2/GAC addition in order to remove pathogens and micropollutants, ensuring the absence of pathogens and micropollutants (Vigo); iii) Separation of BW and KW for their treatment by means of anaerobic digestion, which effluents will be converted into ammonium sulphate by ammonia stripping and struvite, safe regarding pathogens and micropollutants (Helsingborg); iv) Production of NPK liquid and solid organic fertilisers by means of a cost effective one-step treatment consisting of HTAD treating BW ultra-concentrated by using vacuum toilets (Sneek) and v) Monitoring of data and modelling of the process, leading to a Smart Platform which will help to maximise nutrient recovery and will provide advice to implement the technologies at other sites. Swedish University of Agricultural Sciences The overall objective of WP4 is to link the recovered nutrients in Run4Life with its potential market uptake possibilities as hygienically safe fertilisers. For such purpose; key end-users included in the consortium will participate in validating the quality of the product. This process will be based on the accomplishment the following partial objectives: i) Identification of the Key Performance Indicators (KPIs) for optimising the nutrient recovery process; ii) Full characterisation of products obtained in WP3 in terms of quality using standard procedures in order to ensure that their chemical composition fulfil end-users requirements and iii) Evaluation of the obtained products (fertilisers and reclaimed water) for its use in agriculture applications as an alternative to conventional fertilisers at pot and field scale in terms of growth enhancement and toxicity/safety. Universidad de Santiago de Compostela The objective of WP5 is to ensure that the developed Run4Life system, as well as the products obtained, is safe and reliable to use, environmentally friendly, social accepted and techno-economically feasible. The risk and sustainability assessment of the different technologies and approaches will be faced in an integrated manner and taking into account the whole Run4Life life cycle. Special attention will be given to the assessment of pre-commercialisation challenges of Run4Life solution (health and environmental risks, social perception...). Through a continuous interaction with WP2-4, WP5 will provide: i) Risk and Sustainability Assessment Plan; ii) Environmental impact assessment using LCA based standardised methods; iii) Economical evaluation of Run4Life solution; iv) Environmental technology verification and ETV statement and v) Evaluation of the risk perception from a social point of view. feasibility and acceptance of the Run4Life technology. ISLE The exploitation activities within WP7 will ensure the needs of the market are taken into account during the technology optimisation and demonstration stages and that clear routes to market and potential clients are identified. This will ensure that upon completion of the Run4Life project, the road to commercialisation is clearly defined and the time to market uptake is accelerated. WP7 key objectives are as follows: i) Identify and quantify the market opportunities for the Run4Life technologies to help support the development of a marketing strategy and Business Plan with a strong value proposition; ii) Identify and analyse potential competing technological solutions and their providers; iii) Design Exploitation and Business Strategy with a short and mid-term vision for the Run4Life technologies introduction to the market after the end of the project; iv) Identify and compile new knowledge and outcomes generated within the project; v) Implementation of Run4Life business model and technologies at a 5th location (Czech Republic); vi) Closely monitor the Run4Life technology development and manage relevant exploitation issues related to Intellectual Property Rights (IPR) and knowledge of the partners and vii) Prepare for licensing or other type of knowledge and IPR transfer agreements between the project partners and the industrial actors interested in manufacturing and commercialising the technology. LeAF WP8 aims to influence the attitudes of stakeholders, including the decision-makers, towards the implementation of resource recovery oriented sanitation solutions. The experiences and generated knowledge of Run4Life will be communicated to the widest possible audience, to enhance the exploitation potential and public acceptance of the project results and outcomes. The main objective of WP8 is to ensure effective external Communication and Dissemination (C&D) of Run4Life results and applications to raise awareness of, inform about, engage and promote Run4Life. The specific objectives are: i) Ensure effective communication and dissemination of Run4Life, its objectives, activities and results by employing tools that address different stakeholders along the value chain; ii) Implement the Run4Life Communication Plan (linking the Programme dissemination strategy), in collaboration with the Exploitation and Business Plan in WP7; iii) Demonstrate how Run4Life results are contributing to the European Innovation Union (relevant initiatives); iv) To carry out and support effective technical dissemination of Run4Life results via publications, conferences, networks and external collaborations; v) Establish linkages and collaboration with other relevant projects and initiatives to amplify the impact of Run4Life’s work; vi) Design, organise and run the final Run4Life project conference and vii) Engage in outreach activities to help consumers and end-users accept nutrient recovery and recycling.